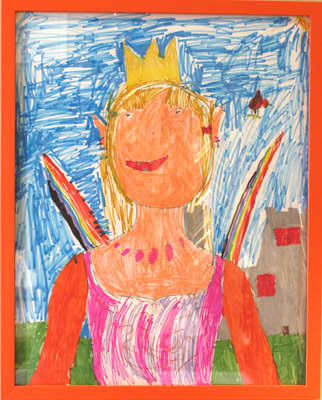 Frame your child's artwork and celebrate their creativity! Framing art made by kids is one of our favorite jobs! Preserve your child's treasures including drawings, paintings, collages, and ceramics with protective framing. Present their creative masterpieces in gallery black and white framing for a sophisticated look that fits your home, or frame them for fun in a colored frame and mat to hang in their room. We have a style and solution for every budget. Drawings made with magic markers need extra protection from light damage. We use conservation glass on any artwork that may fade -- it filters out 98% of UV light! You'll love the result and the price. We chose a rustic pink frame and cream mat with yellow accents for this fun and colorful collage piece by a young artist. Raising the mat leaves extra space for the feathers, and adds visual dimension! 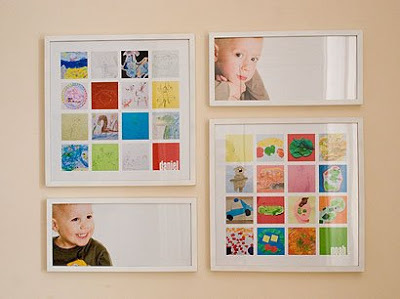 White frames are a hot design trend that is perfect for kid's art or fun groupings of small originals. Modern and light, white frames complement colored artwork. Add conservation glass or plexiglas to protect children's art from light damage, dust, and dirty fingers. Save Those Special Paintings That Make You Smile! Sure it's a finger-painting- but it reminds you of your child's pride when they brought it home from school, or their joy in making it. Let us help you put it in a frame and preserve that joyful memory! Photos and children's drawings combine here to make a balanced grouping. White frames keep it simple and connected.